Haverim - Live Israel ! / Pastor John Hagee: "Ani Yisreali - I Am An Israeli"
Pastor John Hagee: "Ani Yisreali - I Am An Israeli"
One of the definitions of courage is the willingness to stand up for principle and for what's right and be counted —regardless. 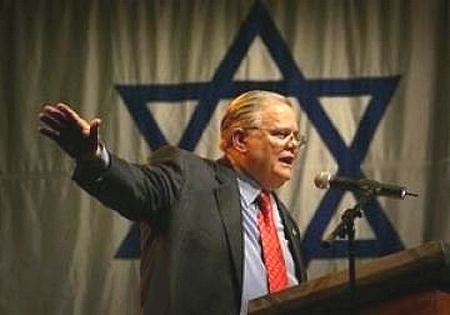 As my regular readers know, Pastor John Hagee of Christians United For Israel (CUFI) and the Cornerstone Church in San Antonio, Texas has epitomized that kind of courage for years. Christians United For Israel Washington Summit....an annual event when the Pastor marshals thousands of his troops and goes forth to buttonhole Congressmen and defend Zion in the halls of Washington D.C.
Our world is divided into two groups: those who support Israel and those who do not. We stand with Israel today, tomorrow, and forever. Can we sit in silence when the president tells Israel it cannot build homes in Jerusalem? Can we support any peace process that rejects Israel's right to exist? Peace is a two-way street. Israel cannot make all the concessions for peace; the Palestinians must make concessions also. Can we support any treaty that does not recognize Israel's right to defend itself against all enemies? Can we support toothless sanctions that allow Iran to develop nuclear weapons and risk the horror of a nuclear holocaust? What do you do when Iran's leader denies the Holocaust? You do what you have to do to make sure there will never be another Holocaust. Iran with nuclear weapons will give terrorists around the world an umbrella under which to operate — and that includes America. When will Washington understand that Russia and China are on Iran's side? Didn't we just arrest 10 Russian spies? Can "we the people" call this nest of spies an act of friendship? America is at war with enemies who hate us more than they love life. Can we continue stumbling through this politically correct fog without moral clarity and without an absolute commitment to victory? Ronald Reagan (God bless his memory) was asked: "How does the cold war end?" Reagan responded: "We win, they lose!" We are united. We are indivisible. Our goal is victory — for without victory there is no survival. Santayana said, "Those who cannot remember the past are condemned to repeat it." In the 1930s, America's leaders put their heads in the sand and ignored the threats of Adolf Hitler. Hitler pledged to kill the Jews. Washington: "He's just saber rattling!" Hitler called the Jews inhuman. Washington: "He really doesn't mean that!" Hitler said the Jews should be wiped off the face of the earth. Washington: "He's having a bad day." Now comes Ahmadinejad of Iran, leader of a violent theocratic dictatorship who has promised to "wipe Israel off the map" and declared that "the Zionist regime is doomed." Can we put our heads in the sand and stupidly say, "He is just saber rattling; he really doesn't mean it"? Can we ask Israel to make peace with Hezbollah and Hamas, two terrorist armies trained and funded by Iran that have stockpiled tens of thousands of missiles capable of hitting Israel's major cities? We must also acknowledge a relatively new threat to Israel. This is not a military threat, but it is every bit as dangerous. Today Israel faces a concerted campaign to deny its very legitimacy. When this campaign first began years ago, it was confined to the political margins — the far left and the extreme right. Unfortunately, the campaign to delegitimize Israel is going mainstream. We see the effort to delegitimize Israel in our international bodies. In 2001, the nations of the world gathered in Durban, South Africa to confront the evil of racism. Yet this conference never actually got around to dealing with the very real racism present in so many nations around the world. Instead the representatives gathered in Durban condemned only one nation. You guessed it — they condemned Israel, over and over, with no regard for truth and no connection to reality. A memorandum issued in Durban called Israel a "racist, apartheid state." This theme — that Israel is an apartheid state — has since become the mantra of those who hope to delegitimize Israel. This lie was given a major boost in 2006 when former president Jimmy Carter released a book titled — Palestine: Peace Not Apartheid. Carter's book helped to give legitimacy to this outrageous slander. He should be ashamed. We see this campaign to delegitimize Israel on our college campuses. Every March, more and more campuses host a week of anti-Israel speakers and demonstrations during something called Israel Apartheid Week. This year, events marking Israel Apartheid Week were held on campuses in over 40 cities worldwide, including many right here in America. At the University of Texas in Austin, students erected what they called an "apartheid wall" on campus, claiming it was a small replica of what Israel had built along the 1967 border. Thus, in today's newspeak, Israel's effort to protect its citizens from deadly suicide bombings becomes "apartheid." Yes, it's a ridiculous lie. But for students who don't know better, it's reality. In addition, America's campuses have become hostile territory for anyone with a pro-Israel message. Pro-Israel speakers are consistently disrupted and shouted down. Earlier this year, Israeli Ambassador Michael Oren was invited to speak at the University of California, Irvine. Members of the Muslim Students Association at that school had other plans. They rose to disrupt the ambassador at timed intervals to ensure that no one would have the benefit of his insights. The students then marched out of the hall together and had the nerve to claim their rights to free speech had been violated. just as they did to companies doing business with apartheid-era South Africa. Several weeks ago Presbyterian leaders in Minneapolis approved a call to end U.S. aid to Israel unless Israel stops settlement expansion. Shame on the Presbyterians. Imagine — these denominations are not considering divesting from Iran, but from Israel. Israel an apartheid state? Israel a racist state? Do facts matter any more? Does reality no longer count? Israel has 1.5 million Arab citizens with full civil rights. In Israel, incitement to racism is a serious crime. In Israel, political parties promoting racism are banned. There is an Arab justice on Israel's supreme court. There are Arab members of the Israeli Knesset. Arabs serve in high-ranking positions in Israel's army and foreign service. but to welcome them as free men and full citizens. Israel's cause is just. But if the people of the world don't know this truth, it is worthless. It is up to us to spread the truth so that it will be known. At Christians United for Israel, we are doing our part to spread the truth. We are four and a half years old and already we have grown to become the largest pro-Israel organization in the world. We have over 425,000 members, including thousands of America's top spiritual leaders. Through these leaders our message reaches millions of Christians in America and around the globe. This year we have begun a Hispanic outreach to bring America's rapidly growing Hispanic churches into the pro-Israel camp. We have begun an African American outreach to bring even more of America's black churches into the pro-Israel camp. Our CUFI on Campus has continued to grow and flourish, with student leaders working hard to teach the truth about Israel in the most difficult of circumstances. CUFI conducts an average of 40 pro-Israel events in cities across America every month. In church after church across this country we are telling the truth about Israel. And our members then leave these churches and share that truth with their families, friends and neighbors. Every year we gather in Washington to let Congress know that no matter how much noise Israel's opponents make, America's Christians stand with Israel through thick and thin. Almost 50 years ago, President Kennedy flew into the divided city of Berlin at the height of the cold war. He flew there at a time when West Berlin was a tiny outpost of freedom surrounded by communist tyranny. He flew there at a time when West Berlin was surrounded, hounded, boycotted, and hungry. He flew there to send a strong message of solidarity and resolve to the brave West Berliners. Here is what President Kennedy said in that place at that time: "Two thousand years ago the proudest boast was Civic romanus sum — I am a Roman citizen. Today, in the world of freedom, the proudest boast is "Ich bin ein Berliner — I am a Berliner." "All free men, wherever they may live, are citizens of Berlin, and, therefore, as a free man, I take pride in the words Ich bin ein Berliner." We need to remember those words now more than ever. Today, I stand in the capital of the greatest nation on earth, the United States of America, at a time when Israel is a tiny outpost of freedom and democracy in a sea of tyranny. I stand here as Israel is surrounded and hounded, boycotted and threatened. I stand here with a strong message of solidarity with you, my Jewish brethren, the apple of God's eye. At this difficult juncture in our history, permit me to say something to you straight from the heart. Please know that what I say now is a sentiment shared by millions of Christians across America and around the world. Today, in the world of freedom, the proudest boast is "Ani Yisraeli — I am an Israeli." All free men, wherever they may live, are citizens of Israel. Therefore, as a free man, I take pride in the words "Ani Yisraeli — I am an Israeli." When international bodies ignore the world's genocides, massacres, and racism to attack Israel, we proudly proclaim: Ani Yisraeli — I am an Israeli. When college professors teach lies about Israel and students loudly call for Israel's destruction, we proudly proclaim: Ani Yisraeli — I am an Israeli. When hateful protesters try to shout you down, we proudly proclaim: Ani Yisraeli — I am an Israeli. When flotillas filled with militants seek to turn Gaza into an Iranian port, we proudly proclaim: Ani Yisraeli — I am an Israeli. When the world condemns Israel for defending its citizens from thousands of missile and mortar attacks, we proudly proclaim: Ani Yisraeli — I am an Israeli. When terrorists threaten to kill Israelis, we proudly proclaim: Ani Yisraeli — I am an Israeli. When madmen threaten to destroy Israel, we proudly proclaim: Ani Yisraeli — I am an Israeli. When Israel's allies grow weary of fighting tyranny and oppression and seek an easy out that ultimately brings danger closer to our own door, we proudly proclaim: Ani Yisraeli — I am an Israeli. Israel and America share the same love of freedom.Israel and America share the same passion for democracy. Israel and America share the same Judeo-Christian values. Israel and America share the same love of life. Israel and America share the same enemies. Israel's enemies are our enemies. Israel's fight is our fight. If a line has to be drawn, then let it be drawn around both of us — Christians and Jews, Americans and Israelis. We are one. We are united. And we will not be discouraged and we will not be defeated. In the end — when the last battle has been fought — the flag of Israel will still be flying over the ancient walls of Jerusalem. Israel will prevail. These words deserve to be posted and repeated in every church and synagogue in America.